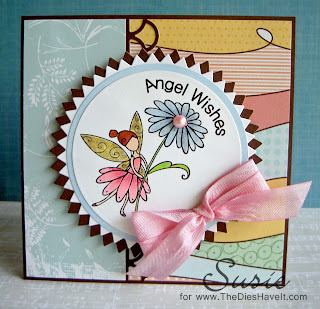 Here is my card for this week's Cupcake Inspirations Challenge. Our terrific sponsor this week is Whimsy Stamps. I just fell in love with this little angel with the sparkly wings. Once I got her all colored in and sparkled up, she made me smile! Be sure to head on over to Cupcake Inspirations and check out what all the designers have created for you. Then take a look at the inspiration photo and get to work creating. I also decided to enter this week's card in a challenge at the Digital Tuesday Challenge blog. This week their theme was sparkle and shine. Well, my little angel does both! So head on out and get your creative on. This card is so sweet!! I love how you matched the paper colors to the stamp!! so cute! !